In 2010, I wanted to make a quilt for my brother-in-law. He was back in school (law school) at the University of New Mexico (UNM), and he and my sister-in-law (my husband’s sister) were enjoying going to Lady Lobo basketball games. The UNM school colors are red and gray, which (legend says) happened to be colors of primer that a local contractor had on hand when the school was built. 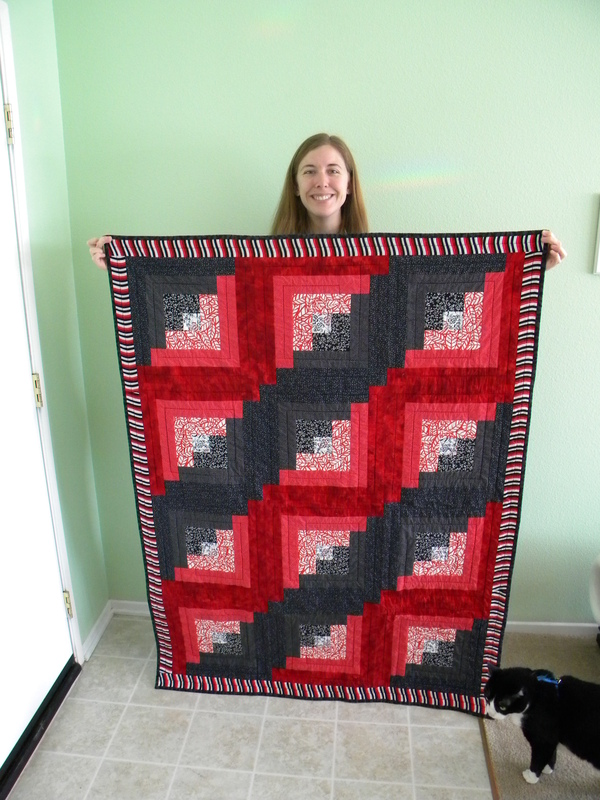 I opted for more of a black and red quilt than strictly school colors, though. 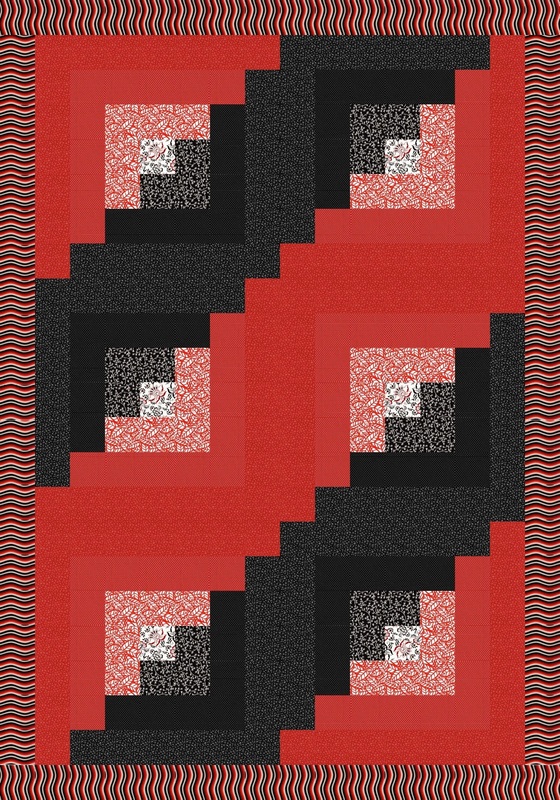 Log cabin quilts have always been near and dear to my heart, and I still think this red and black version is very striking. At the time, I went very fancy pants for the quilting: I quilted (with a walking foot) the letters UNM LAW in the center of the log cabin blocks. I then rotated the quilt 180 degrees and did it again so the quilt would always be “right side up” whichever way it was turned. Red is a color that I do not work with much, so even though I was planning to do a log cabin quilt, I used my design program of choice for the time (Microsoft Paint) to create a pattern design which also helped me select the fabric for the quilt. I purchased some prints that I though my brother-in-law would like, including some with paw prints on them. The red paw print material was way to pink in person, though, so I did have to substitute another fabric. 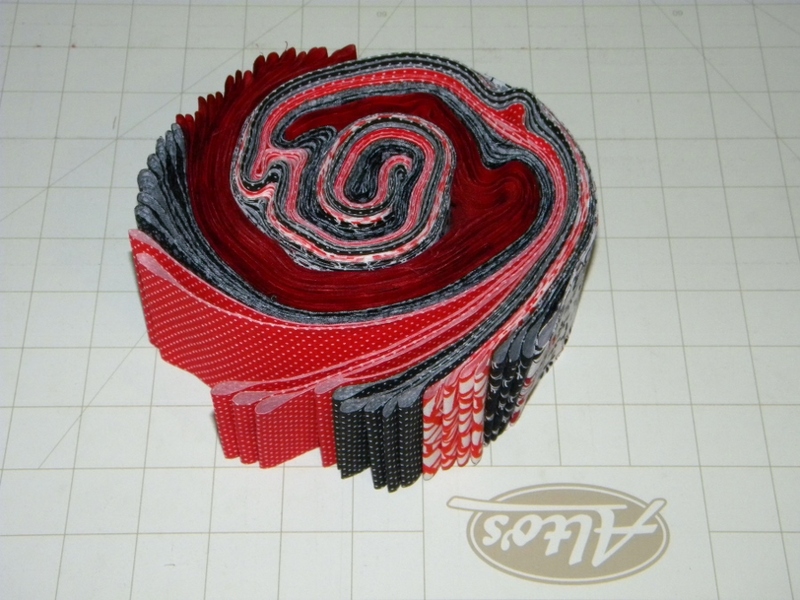 I thread basted all my quilts until sometime in 2013, when I learned about pin basting. 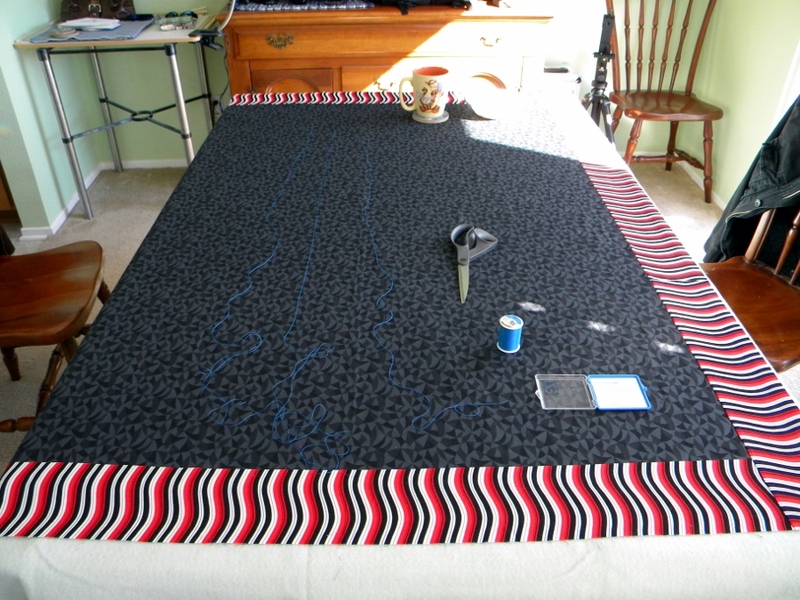 I liked to use a high contrast thread color for basting so that it would be easy to see and remove after quilting. Puppy the Cat has always been quite the quilt inspector. 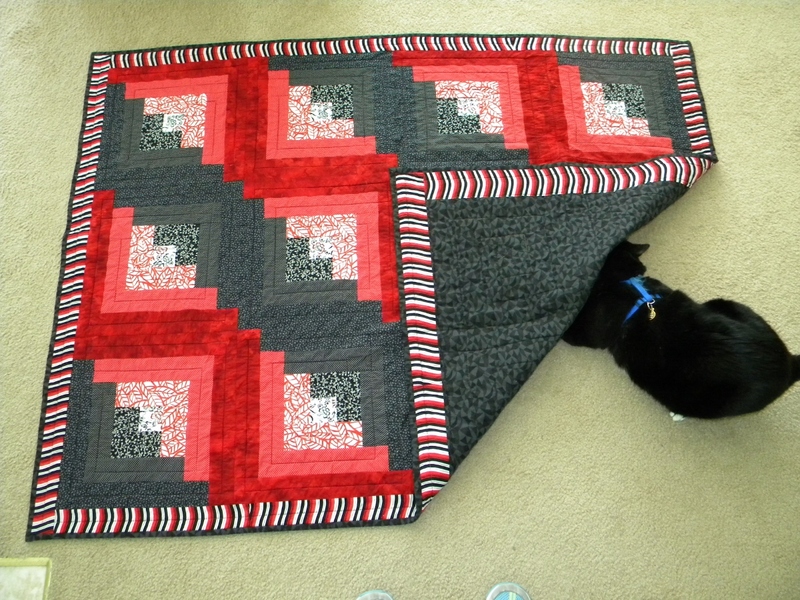 I really like the stripey red / white / black fabric I found and used for the border for both the top and back of the quilt. The log cabin blocks were made from 2.5-inch wide strips, so after prepping all the fabric for the quilt top, I apparently had a bit of fun making my own “Jelly Roll”. Linking up with Throwback Thursday. Your smile says it all…but great finish. I love red, black and white together and well, don’t think we can ever go wrong with a log cabin pattern! Beautiful quilt, the border print is really fun and coordinated well with the log cabin blocks. This quilt has stood the test of time design wise, its the strong colours that are still in vogue today. Your brother in law has come through a lot. Strength of character really does seem to help some people pull through, we have a friend with a very similar story. Good Morning Yvonne! Your Log Cabin Quilt turned out great! It has such depth and I can tell you did go to great lengths to pick out each and every fabric. That is wonderful and worked perfectly for this quilt and so many of your quilts. Your story along with the quilt gives me courage also knowing that he is still fighting to push forward and achieve his dream! That is spectacular and I know some of what he goes through and will add him to my prayer list and pray that he succeeds. Thank you for sharing and have a fantastic creative day! This is a beautiful quilt. Love the red and black. A truly beautiful quilt made more special by the story of your brother-in-law. Thank you for sharing. Red and black are a classic combination, one I never tire of! This quilt hits all those notes and then some. I have never thread basted before. I think if I had I would never have learned to quilt!! How amazingly strong, determined and very lucky your BIL is. I cannot imagine…I see why his journey in life gives you goosebumps! What a very nice story! I love your quilt! I have always been a huge fan of log cabin blocks but have yet to make a quilt with them, hmmmm! On my very long to-do list,ha,ha! I love a log cabin too – always catches me for whatever reason- verstility or nostalgia I don’t know and the colour scheme is classic for the classic block. Great gift! What a very nice gift for your BIL. 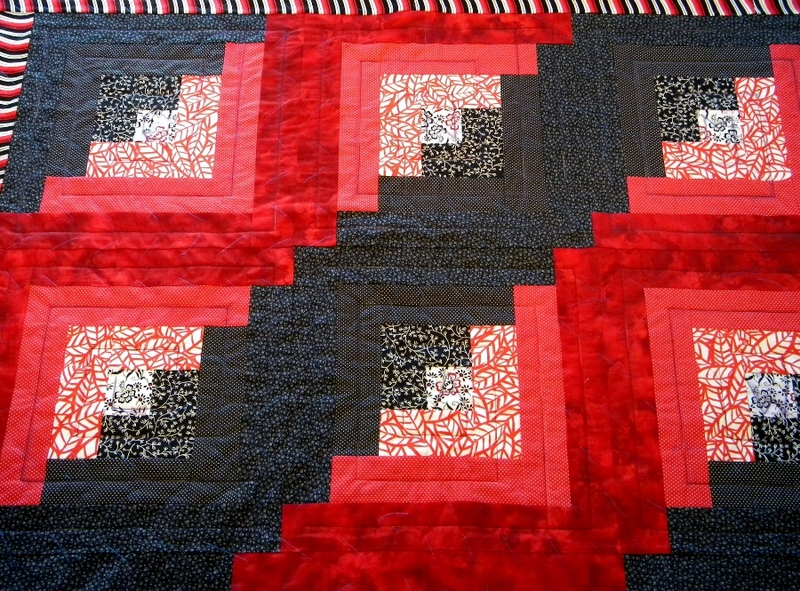 I’ve always loved Black/Red and white quilts. There is just something very classic about it. And I have a completely non quilting question…it’s a Puppy question. I notice he almost always has a harness on. Do you take him outside? Caroline is the first inside cat I’ve had that is obsessed with wanting to check out the outside world. I was debating on getting a harness for her. Beautiful quilt! Love the log cabin pattern. I made a log cabin quilt for my son-in-law using Dallas Cowboys colors ( he is a rabid fan). I purchased the fabric from a quilt store in Cheyenne, Wyoming (Denver Bronco fans there), but the ladies in the shop graciously helped me find all the right shades for his quilt. Your brother-in-law sounds amazing. I am sure that quilt means more to him than words can convey. Beautiful Quilt Yvonne; I love the fancy pants quilting. Log cabin is one of my favourite blocks/quilts too; made one for my dad, years ago. Yours is really lovely. I, too, don’t use red a lot (much to my grandson’s dismay, ha) but I do love it with black and white. I love seeing how involved Puppy the Cat was throughout the process! I also think what you did with the border on the front and on the back is really unique and adds that extra oomph! I love log cabin quilts too. Yours is beautiful – red and black make for such a striking and timeless combination. It does sound like your brother-in-law is qualified to make motivational speeches…what a story! Beautiful log cabin quilt. I need to make one someday. I love this quilt. Log cabin in red and black is definitely a winner. Your brother-in-law does sound amazing.